Grand Opening and Book Signing Event. This Saturday, January 29th starting at 12pm will mark the grand opening of the Kurt Vonnegut Memorial Library in downtown Indianapolis. This opening will begin with a ribbon cutting ceremony along with a soon to follow book signing event by Majie Failey. Majie Failey is Kurt Vonnegut’s lifelong friend and author of a new book about their friendship titled “We Never Danced Cheek to Cheek”. This event will also feature musical performers as well as a discussion with Heather Augustyn, the last person to interview Kurt. This event is free and open to the public. Please call the library below for more details. Hawthorne’s new release We Never Danced Cheek to Cheek: The Young Kurt Vonnegut in Indianapolis and Beyond by Majie Failey is a journey through the life of this member of the Class of 1940—with all of its carefree existence and its abrupt graduation into war. This book by one of Kurt’s lifelong, closest friends digs deeply into intimate moments, days, and years of the famous writer’s youth. Here are stories and photos never before seen from scrapbooks, issues of the Shortridge Echo where Kurt was an editor, childhood art and writing pieces, journals from his Owls Club road trips to the far west and Florida and insights into his family. And beyond high school, this is the story of the consistent, kind concern of this Pulitzer-Prize winning author for his old friends, the support he gave as the Class of ’40 all grew older, and bittersweet moments as he himself confided his concerns over career and aging to his friends. For the Kurt Vonnegut fan, reader, and collector, our online bookstore offers a unique selection of Signed Limited Editions of some his well known works. These rare works were originally published by Easton Press and luxuriously bound in full genuine leather with gilded page edges. 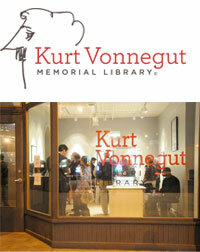 For pricing and availability, please browse our Kurt Vonnegut collector’s corner .